For a clever way to present everyone's favorite treat, try making chocolate candy wreaths. They are a versatile candy craft that will cause everyone to think you're a crafting genius. This is a chocolate candy adventure that you can complete with your kids, or with a class or group. I think it would be a really fun project to make on an afternoon when girlfriends are visiting, and you can all take home your own project to use as a holiday wreath or centerpiece. I'm thinking of organizing a crafting session for our church ladies' group where we all bring a bag of wrapped chocolates and create a chocolate candy centerpiece during the meeting. A candy wreath can do double duty as a great centerpiece for a holiday table as well something pretty to hang on the wall. By placing a tall candle or some other decorative item in the center, you give it a whole new look. Depending on the holiday, try to choose chocolates that have holiday appropriate colors. A lot of companies, like Hershey's and Reese's, etc., change their standard wrappers for green and red at Christmas, black and orange for Thanksgiving and Halloween, pink, red, and white for Valentine's Day, and pastels for Easter. Once you've made the decision to create chocolate candy wreaths or centerpieces, plan ahead so that you have everything you need to get started. The Craft Ring - foam and grapevine wreaths work great, but you can even use a length of heavy-duty wire. Something to attach the candy with - floral picks for a foam wreath, hot glue for the grapevine wreath, or curling ribbon fro the wire wreath. Decorative Items to finish it off - ribbon, bows, silk flowers, pine cones, etc. 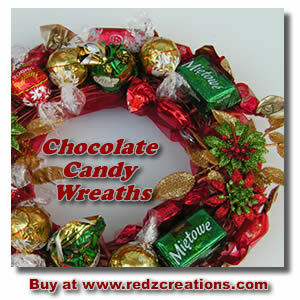 Here's a selection of supplies for making chocolate candy wreaths to give you an idea of just what you are looking for. In addition to those choices, I particularly love to get my supplies at Candyland Crafts, especially if you want to make your candy from scratch. They have the chocolate, the molds, and the wax paper and wrapping foils in a variety of colors. Now that would be a real project! It's really pretty easy to assemble a chocolate candy wreath or centerpiece using a foam or grapevine wreath base, especially if you use the hot glue gun method. You simply apply a little bit of hot glue to the back of the wrapped candy and hold it in place for a couple of seconds in the desired location on the wreath. Hot glue is HOT, so do be careful that you don't burn your fingers. If you decide to use the floral picks, I would choose wrapped candy that has twisted ends so that you can poke the pick through it without affecting the seal on the candy - make sense? This method is a little trickier, so I've tried to explain the steps in a bit more detail. I hope you get the idea. Tie one end of your ribbon to the hoop. If you have joined wire together, start at one side of the joining. Wrap the ribbon around the hoop leaving a small loop to insert the end of the chocolate candy wrapper. Place one piece of candy in the first loop and pull taught to secure it. Continue wrapping the ribbon and inserting the candies two at a time. Push the added candies tighlty against the previous ones as you go. As you continue around the hoop, the candies will fan themselves automatically around for a complete look. Stop adding chocolates about 1-2 inches from where you started. Tie off the ribbon. Secure a large bow at the top in the gap that you left. If you make a chocolate candy wreath or centerpiece, please be sure to show it off to us. We'd love to see it!